Animal Aid UK understands that shopping in supermarkets as a vegan can be frustrating and time consuming, and they hope to be able to make vegan’s lives easier with their “Mark It Vegan” campaign, which focuses on major supermarkets. And hot on the heels of the news that there has been a 360% rise in Britain’s vegan population since 2006, now is the perfect time to introduce mandatory vegan labelling – for convenience as well as to help customers avoid mistakes. As the majority of supermarkets don’t currently label their products as being suitable for vegans, this often leaves them with no choice but to go through the entire ingredients list of each product to check whether it is suitable, which is not only laborious, but also runs the risk of mistakes being made. 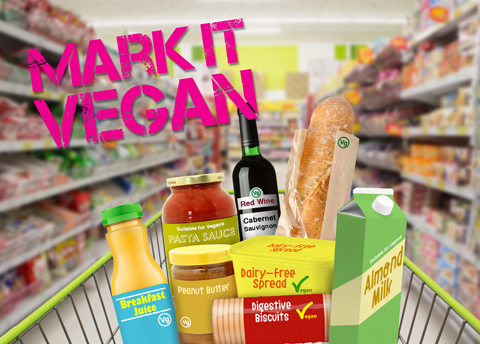 Animal Aid UK says that the goal of the “Mark It Vegan” campaign is to have all of the remaining seven major supermarkets clearly label all of their store-brand products if they are vegan, by having ‘suitable for vegans’ printed directly on the packaging, or by using a clear symbol. Animal Aid UK is advocating for these adjustments to be made within the next 12 months, to ensure that there is enough time for companies to adopt the changes. Visit the Animal Aid UK website in order to find ways to get involved with this campaign.